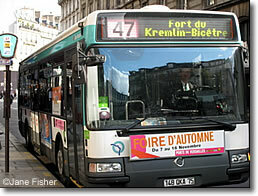 Buses are an important part of Paris's city transport system: city buses, airport buses, and intercity and international buses. A scenic alternative to the efficient but subterranean Métro, Paris city buses allow you to see the sights as you travel. Above, a Paris city bus. 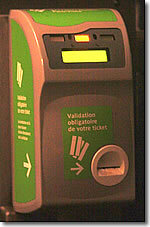 Left, stick your ticket into this machine to validate it when you get on a Paris city bus.